LAKESIDE – The El Capitan girls varsity basketball team got a good look at Poway’s Colby Neal on Thursday, as the Titans’ center scored 23 points to lead her team to a close win over the host Vaqueros. Neal made 9-of-12 free throws, all of them in the second half. 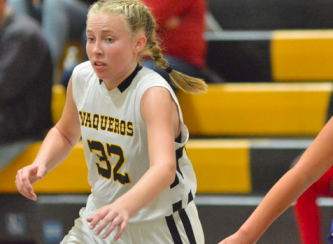 It was a profile game for Neal and El Capitan sophomore MACKENZIE CURTIS, who scored a team-high 26 points. Curtis was also terrific at the line, going 9-for-10, but nearly as impressive from the stripe was Vaquero freshman TIFFANY BICKFORD, who knocked down 10-of-12 freebies. Curtis had three three-pointers in the second half in what was a tight tilt throughout. She is also 46-of-52 from the free-throw line so far this season, averaging close to 27 points per game. Poway led by just a couple after each interval. The final score was one of the largest deficits of the game for El Cap. El Capitan junior DEVON BULLOCK also hit 4-of-4 free throws in the fourth quarter, as the Vaqueros tried to catch the Titans. Both teams are ranked among the top 25 teams in the county. Curtis scored seven points in the fourth quarter, but Poway’s Jessica Marvin added six of her 10 points in the final stanza to help the Titan cause. Neal got Poway going early, scoring eight points in the first quarter, but sophomore SHIANA PERES had a first-quarter trey, and added another in the third, to finish with 11 points. LIBERTY CHARTER 35, VICTORY CHRISTIAN 28 – Liberty Charter improved to 3-2 after pulling away from a 14-12 halftime lead in a non-league game. LINCOLN 62, WEST HILLS 45 – Tahlia Galloway scored 30 points, grabbed 20 rebounds, and had four blocks for the visiting Hornets. ESCONDIDO CHARTER 49, MOUNTAIN EMPIRE 15 – The RedHawks fell in a non-league game on the long road against the White Tigers.